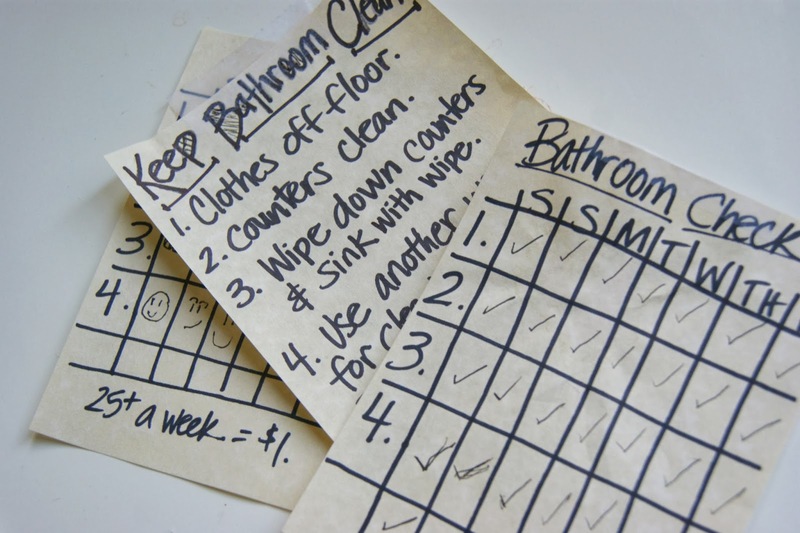 michelle paige blogs: Helping a Tween Keep Their Bathroom Clean! 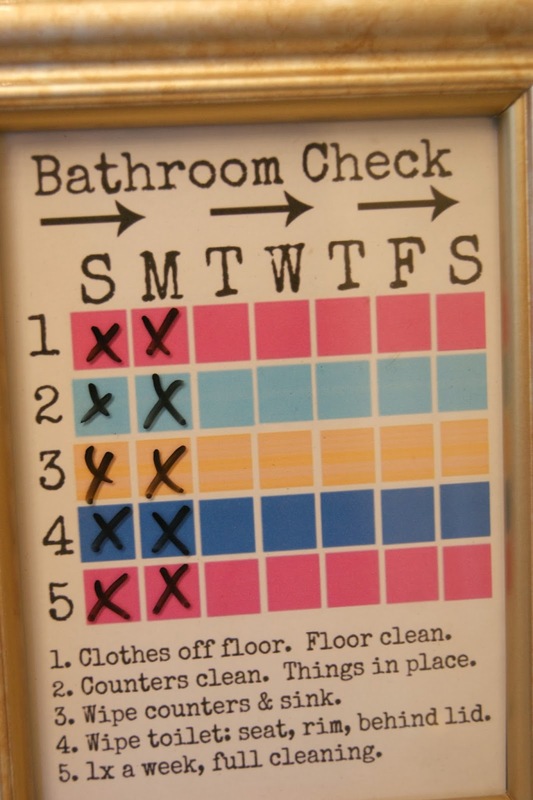 Have a tween or teenager that absolutely cannot keep their bathroom clean? I can now say that my soon-to-be teenager CAN keep her bathroom clean! Want to see how? Thankfully my tween is motivated by money and checking things off a list. Money is tied into a completed checklist. We were having lots of problems with my daughter keeping her bathroom clean. She just wasn't doing it. Clothes, hair products, tissues, toothpaste-- was just part of the mess we all had to look at. Her bathroom is in plain view for everyone to see when they come upstairs. Such an eyesore. My son and his friends sometimes use this bathroom. I needed this bathroom clean! I finally made a checklist and told her I'd pay her for a full checked chart. She loved it! I couldn't believe it! She really enjoyed checking off the chart and bringing it to me at the end of the week for payment. I loved having a clean upstairs bathroom. 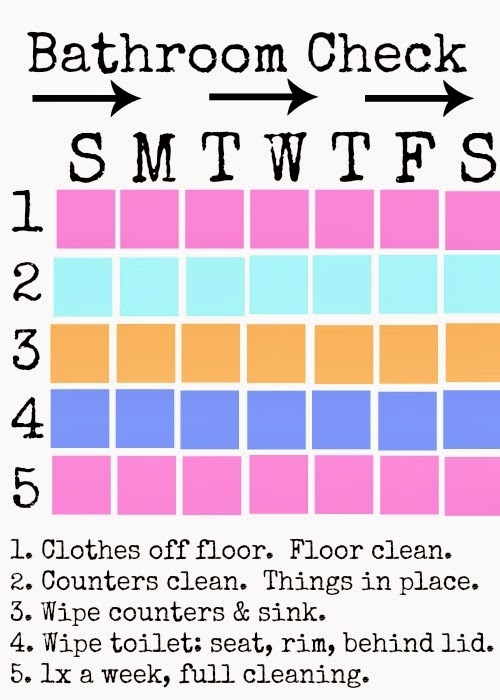 Every week, I'd sit down and make a new chart and every day she'd check the boxes as she cleaned her bathroom. so she stopped cleaning her bathroom. I'm still trying to process if I created a child who will only clean for a checklist and $ attached? I couldn't dwell too much on this thought...I needed a clean bathroom. I immediately got to work and made a chart on the computer that I could put in a glass frame with a dry erase marker to make the marks. Now I won't have to keep making new charts! Here's our chart and what works for us. I walked my tween through each of these steps and modeled how it was to be done. 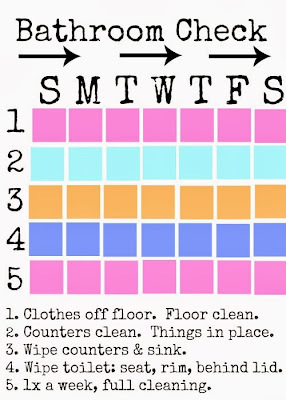 I also gave her a timeframe of when the cleaning had to happen by. In our house, the bathroom must be clean before she leaves for school. 1. Pick up her clothes off the floor. 2. 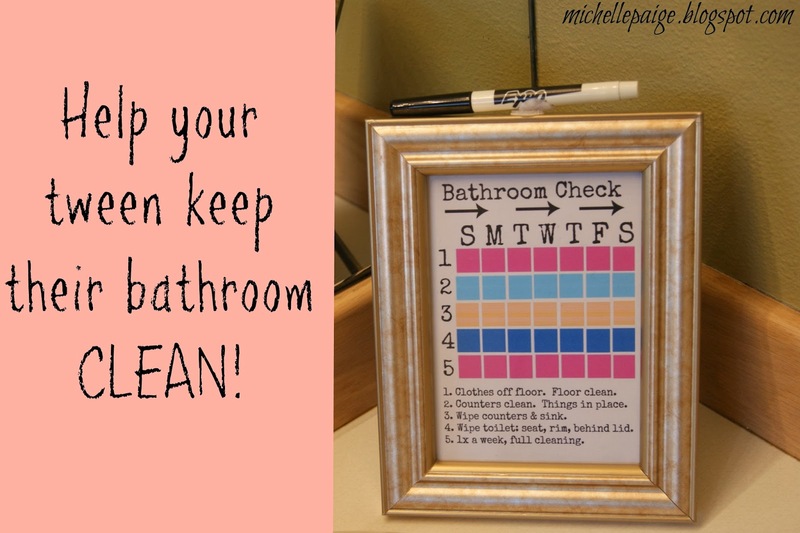 Keep the bathroom counter completely clean. 3. Using a baby wipe (or a cleaning wipe), the counters and sink must be wiped down. seat, under seat (rim) and then behind the lid. 5. 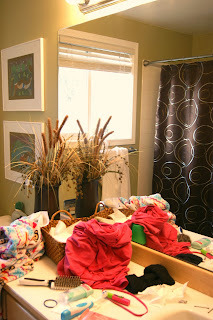 On Saturday, (usually our family cleaning day), my tween is required to help me fully clean her bathroom. 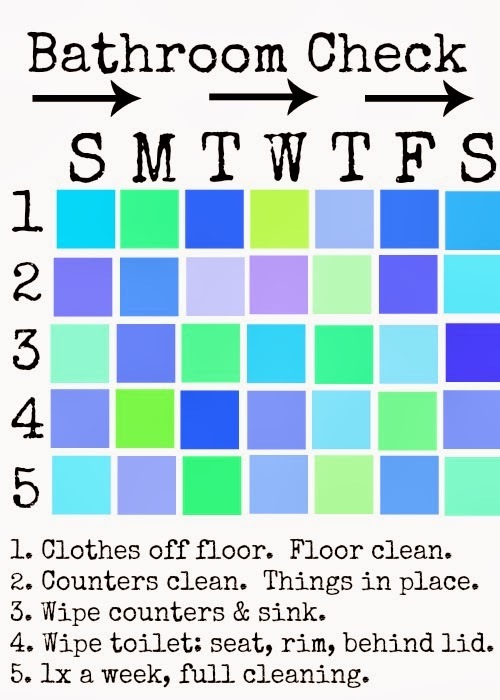 This is when we use cleaning products and not only clean the toilet and counter, but also scrub the bathtub, floor and mirror. 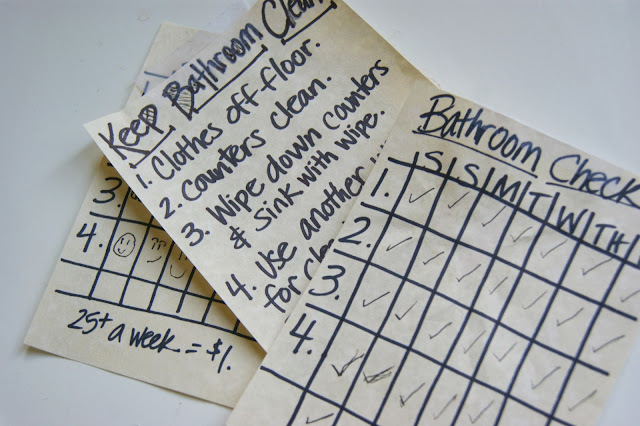 After each step is completed, a check mark is made in the corresponding box. At the end of the week, a full checked chart (or only missing less than 5 checks) = $1.00. You may want to adjust the checks and the payment according to what drives your child. My tween is always looking for more money- and $1.00 is meaningful right now. Later on, I may pay more and possibly require more? We'll see? I'm still thinking this through. If you'd like to use our charts, feel free. 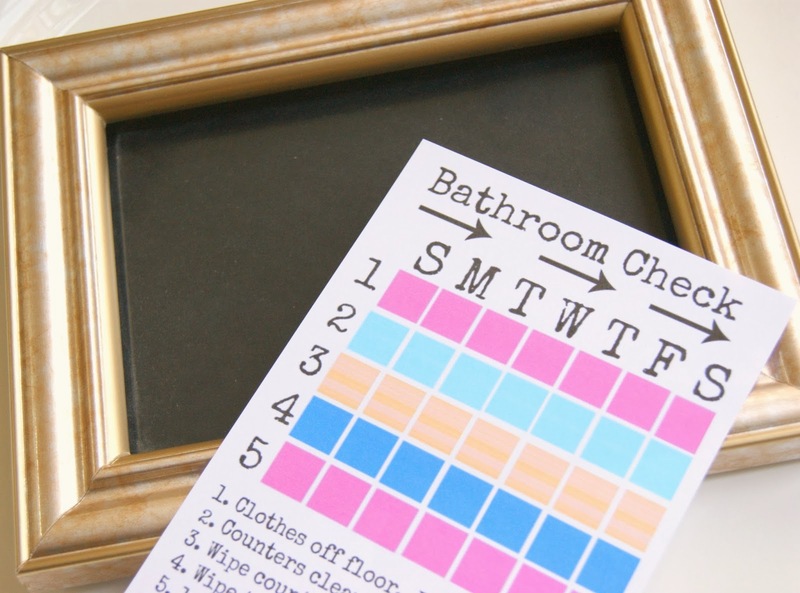 Click here to print out the striped Bathroom Check. 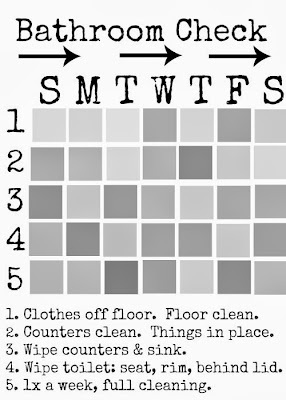 Click here to print out the Gray Bathroom Check. 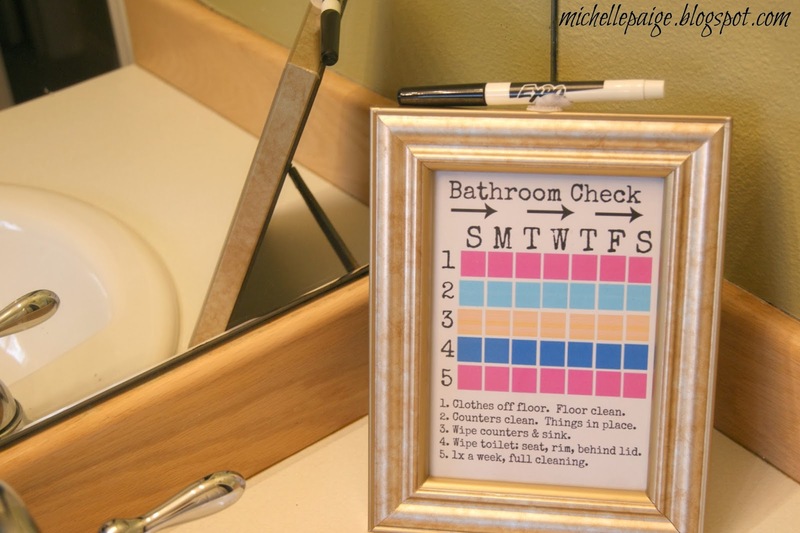 Click here to print out the Blue Bathroom Check. Print out, trim and fit inside a 5 by 7 inch frame. If you want to type up your own steps, just cut off my steps at the bottom and tape on yours. 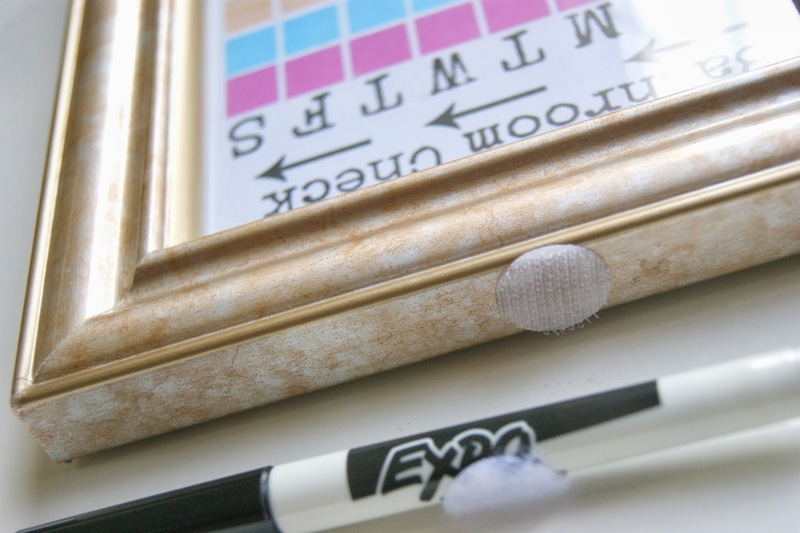 VELCRO Brand - Sticky Back Coins, work great on a dry-erase pen and to the top of the frame. and see if your tween can keep their bathroom clean! I LOVE this! 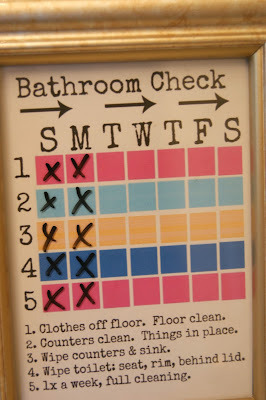 I will definitely be instituting this idea with my boys and their bathroom. This is going to solve a huge problem for us, thank you for sharing your brilliant idea! 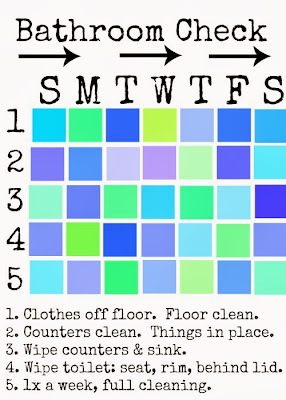 Tween or teenager that absolutely cannot keep their bathroom clean, how about myself?! LOL I was an organized person in my other life I swear. I need this but then again I also need someone to bribe me w/ $ too! This is a wonderful idea. Thank you for sharing the idea and the printable chart. I'd say if she'll do all this for $1, you've got yourself a winning system!! As soon as I saw this I knew that this was the chart I needed. We all share a bathroom, but it's her room that is ridiculous. We just moved in our house and already it looks like she's been here all her life. How they accumulate so much stuff, I will never know. 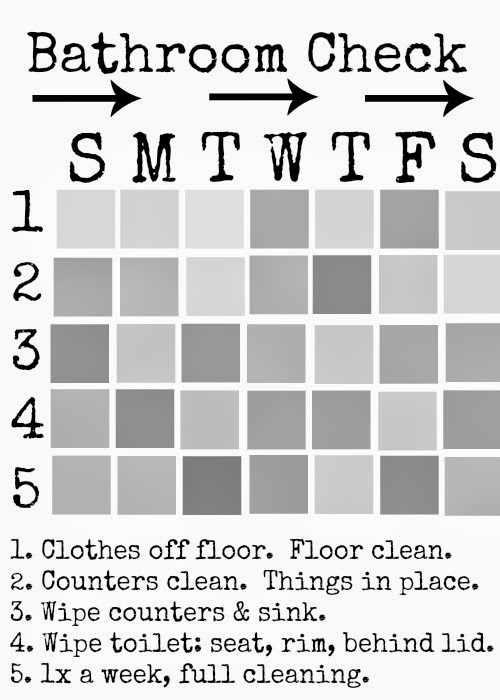 So, I'm modifying this for her room and then making a general one for the around the house responsibilities she seems to "forget". Framing it makes it less child-like and she will love being able to write on it! Thanks! Superb! I really like the bathroom clean check.